A sweet tooth phase or era? Put the dates in a small cooking pot and let them simmer in ½ cup almond milk with the almond extract added for about 5 to 10 minutes until they are very soft. Then mash them with a fork to a paste and let them absorb some of the almond milk. They need to cool down in a separate dish for a little bit before you shape them into little balls. Add the rest of the almond milk to the cooking pot and heat it up to a warm temperature but not boiling. 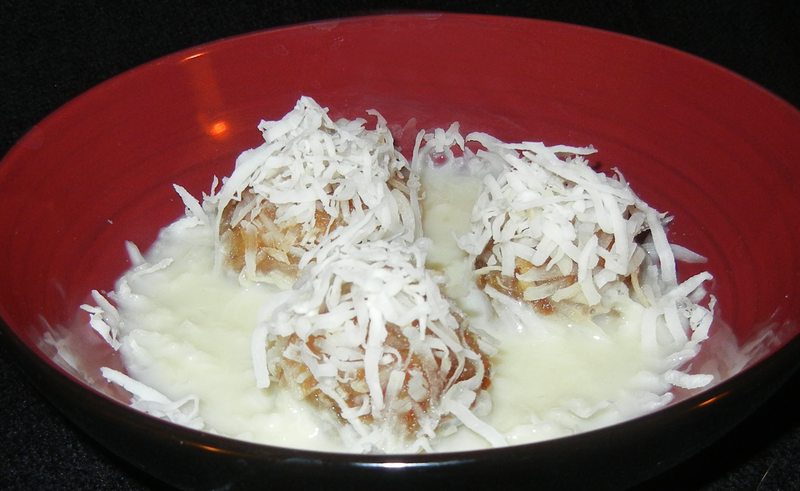 Then pour it in a bowl, shape the date into little balls, nicely arrange in the bowl, and add the shredded coconuts on the top. I had a blast last night! This entry was posted in Desserts, Food, Life, Recipes, Sweets, Uncategorized and tagged Comfort Food, Desserts, Food, Life, Sweets. Bookmark the permalink.